Tools, crampons, Spartan rack: Go. Patagonia's new Levitation Hoody breathes freely, stretches fully and protects against wind and snow to help you float up high-output ice and mixed climbs. Its tough-yet-supple polyester stretch-woven shell withstands coarse granite, while the helmet-compatible hood, with laminated visor and single-pull adjustment, provides exceptional coverage without limiting your vision. Minimalist detailing includes our stretchy Variable Conditions Cuffs, which integrate cleanly with your climbing gloves, two zippered handwarmer pockets above harness line and a zippered left chest pocket. 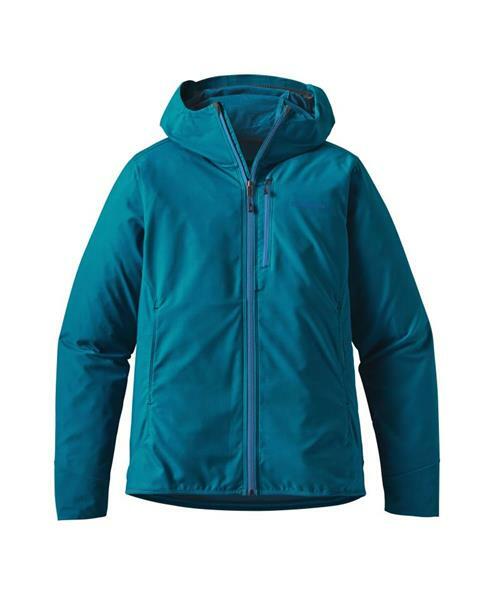 An interior wind flap behind the front zipper seals out drafts, wicking microfleece lines the inner back collar for comfort and the drawcord hem cinches from inside the handwarmer pockets. With DWR (durable water repellent) finish.